The massage includes a delicious Tri-Dosha blend of organic Almond Oil-Sunflower Oil & Coconut Oil with a perfect combo of Essential oils. Ayurvedic Abhyanga’s actual definition is the "movement of sustenance towards all the bodily tissues so they radiate health." What that means is that when we stimulate blood flow and energy flow throughout our body and invigorate our senses, such as through massage, we radiate health. Abhyanga, to me, is the ultimate act of sacred care. What could be more luxurious and nourishing than massaging your body with warm oil into every inch? In fact it's been proven to have benefits. What is a Herbal Compress treatment? The massage includes a delicious Tri-Dosha blend of organic Almond Oil-Sunflower Oil & Coconut Oil with a perfect combo of Essential oils. This treatment are an alternative to a traditional massage. Two major differences are the use of Warm Organic Oil of the Ayurvedic Abhyanga techniques and a warmed compress (poultice), this is filled with up to 20 Thai herbs and oils tailored to your needs which provide you maximum benefit during the treatment. 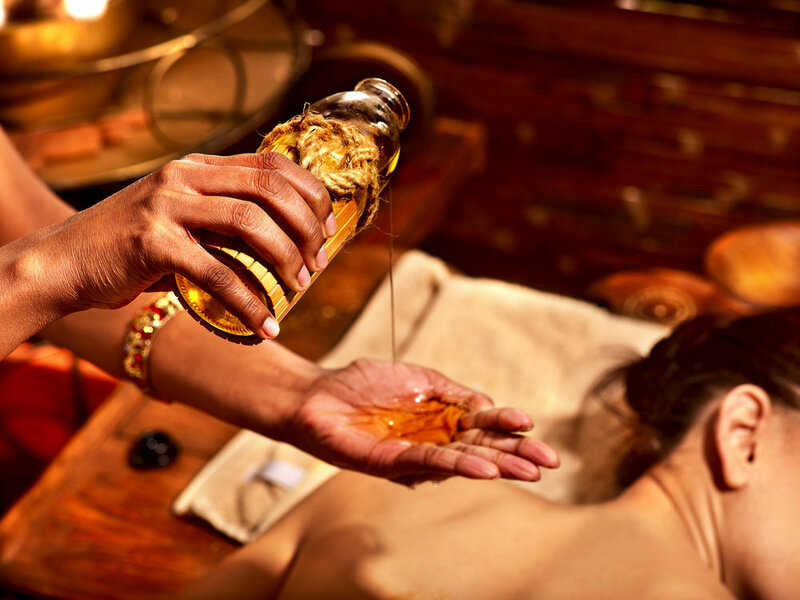 Ayurvedic Abhyanga is the Sanskrit word for oil massage. It's actual definition is the "movement of sustenance towards all the bodily tissues so they radiate health." What that means is that when we stimulate blood flow and energy flow throughout our body and invigorate our senses, such as through massage, we radiate health. A mind-body type is like an archetype. They are referred to as "Doshas" in Ayurveda. The word "Dosha" literally means energy. Think of them like body and personality types. What are these elements like? Fire is hot and powerful, while water is fluid and cool. Earth is dense and grounding, while air is light and moving. Ether is the one you can't see but can feel. It's the vastness of looking up at the stars on a clear day. It's your intuition. Ayurveda uses these elements as references to explain all aspects of your physical and mental well-being. These five elements make up the three Doshas--Vata, Pitta, and Kapha. These Doshas are energies used to describe your food, body, mind, environment, and everything else. Let me explain a bit more about what they are. Abhyanga, to me, is the ultimate act of sacred self-care. What could be more luxurious and nourishing than massaging your body with warm oil into every inch? In fact it's been proven to have benefits.